Create and recreate exquisite sand sculptures with this specially coated sand that lets you sculpt with amazing detail, then break it down and start all over again. Students can also use Delta Fix to paint over their sand sculptures, creating a smooth surface that can be painted or glued onto; the surface then can be peeled off and the sand reused. 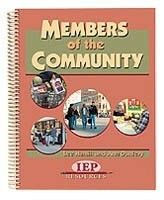 Community outings are linked with classroom setting instruction to teach essential community skills. Three levels of reproducible worksheets plus picture pages for non-readers prepare special need students for actual community outings. 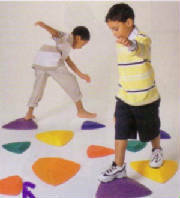 Chidren will have hours of fun on theses stepping stones, while they improve coordination and balance. The goal is to jump from stone to stone without touching the floor. Each has rubber studs on the base to prement slipping and protect the floor. By playing musical tones with their feet or crawling, children can improve gross motor/auditory skills, balance and awareness. Perfect for those with visual impairment. Resilient, ribbed PVC-foam ball gently cushions, is soft to the touch, and easy to grasp for added security.